Seventy-three years ago this week, the world’s first nuclear strike happened in Hiroshima, Japan. The nuclear destruction was so horrific that many people don’t like to think about it. But it wasn’t horrific enough to prevent the nuclear arms race that ensued. Today, the world’s nuclear powers are racing to improve the quality of their nukes. And nations like Japan and Germany are talking more and more about getting their own nuclear bombs. God alone has the solution to nuclear catastrophe. Ten years ago this week, Russia invaded the former Soviet nation of Georgia and asserted control over a fifth of its territory. At the time, Trumpet editor in chief Gerald Flurry said Russia’s attack marked the “beginning of a dangerous new era” in history. Now a decade later, it is clear that Mr. Flurry’s Bible-based forecast was accurate. Russian President Vladimir Putin established a new political wing within the Army on July 30, designed to instill patriotism in soldiers during a time of rising tensions with the West. The move is a chilling echo of a Soviet policy that once saw troops indoctrinated in the principles of communism to ensure loyalty to the party. Putin once said, “[T]he demise of the Soviet Union was the greatest geopolitical catastrophe of the century.” He clearly has made some major gains in his quest to restore Russia’s power and international relevance to its Soviet levels. And Bible prophecy shows that, going forward, he will lead Russia into an even more dangerous and aggressive direction. At 12:01 a.m. on August 7, the United States officially began its first batch of sanctions on Iran following its exit from the nuclear deal in May. European nations, however, would still like to do business with Iran and keep the nuclear deal. And as an expression of its disagreement with the U.S., the European Union has activated an obscure 1996 law to demand that EU companies reject the U.S.’s demands. The Mendocino Complex Fire is now California’s largest fire ever. This blaze is actually a combination of the Ranch and River fires that are burning near Sacramento. These two fires were sparked within an hour of each other and are being treated by firefighters as a singular incident. The fire has charred over 304,000 acres—an area nearly half the size of Rhode Island—and is still growing quickly. There is a biblical reason California is facing severe, apocalyptic problems. To understand it, read our free booklet Why ‘Natural’ Disasters? 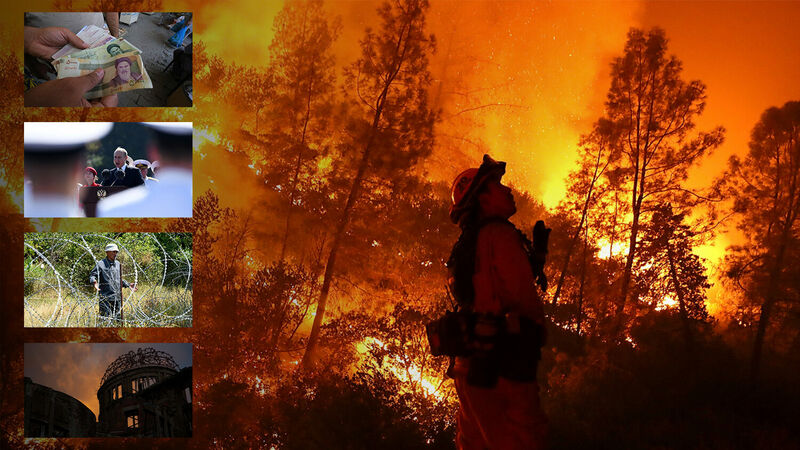 Additionally, listen to Stephen Flurry’s recent Trumpet Daily Radio Show “California Burning—Is Climate Change the Cause?” for a detailed analysis of the real cause of California’s blazing troubles.